You can call me the photographer derby nomad on the road. And on a new note: Th-that may be all folks! for this year. Thanks to everyone who made it happen! I actually ran into the USS DentHerPrise! and K-Wow! Hammer City Eh! Team vs. Killamazoo Derby Darlins in Caledonia, Ontario in February on the coldest day of the year. This is shot INDOORS. 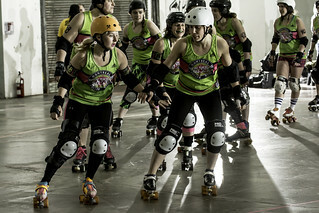 Saturday, March 16, 2013 – first time on the road to photo Woodstock Warriors vs. DRRDy Farmers from Durham ! Threepeat for the Nickel City Knockouts! Thunder Games – Puppies vs. Kitties, a set on Flickr. Here are some Puppies and Kitties at play on the derby rink. The fresh meat from Niagara Roller Girls in Puppies garb had an exciting short bout with the Tri-City Kitties who ended up winning 85-15. All in all, it was part of a fund raising night for the Kitcher-Waterloo Humane Centre. 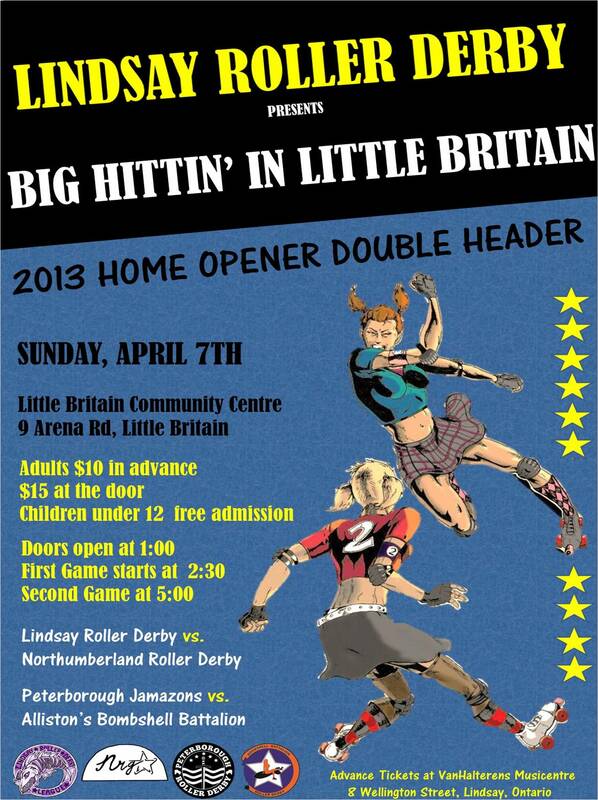 Also, a good excuse to bring up the Lake Effect Furies to face old rivals Tri-City Thunder. The score of the bout: 179-163 Thunder over Furies. Photos to come! DSC_6423-Edit, originally uploaded by Midnight Matinee 24.
Who knew what malice of forethought lay between the sibling rivalry that existed deep with Queen City. 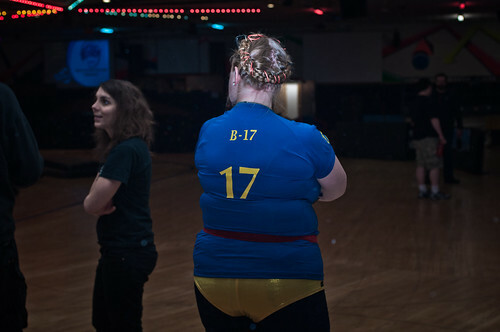 Lamb Chop, captain of the Nickel City Knockouts looked to inflict some pain upon her brother and rival Señor Wiener who stood by the bench of the Suicidal Saucies as their coach. Please note that this is still a story in draft form. Stranger in a Stranger Land – part 3 to come later. These were just some of our thoughts as we ventured back down into the States for yet another heart-stopping experience of the Queen City brand of Derby at its best. The tasty treats of the evening included the Lake Effects ice cream! A tempting selection of Queen City Roller Girls Rocky Road, Salty Caramel, Vanilla & Graceland (inspired by Elvis). Not being able to wait until halftime and at the behest of Diamond CrushHer the Rocky Road was delved into, and it was pure heaven. Cold chocolate and delectable marshmallows for that sweet bite. After ice cream, revenge is a dish best served cold and the Saucies were looking out to get back for their loss to the Knockouts the season before. 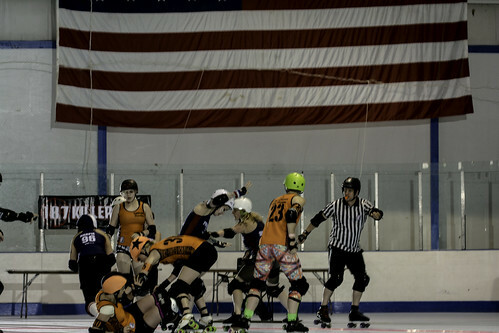 The Saucies bench was strong replete with representation from the QCRG All-star travelling team Lake Effect Furies, but Lamb Chop, herself a Furies veteran, stood with 20 strong Knockouts behind her. In between them stood Mama Chop, the inveterate waver of the mighty foamy lamb chop. But on this game day she could have been torn figuring out how to support the two teams while she bled blue inside. Adding to the mixture was the other family member Shock-Her who had to remain neutral as head ref for the night. The Saucies and coach had to rebound from the sour taste of a loss in a close bout from three weeks before with the Alley Kats, a match that could have gone either way. With first game experience behind them, the Saucies used the interim between bouts to get everyone onto the same page, draftees and veterans alike. Part of the Knockouts advantage was more cohesiveness as a team, having had to fill fewer holes in their roster between seasons. Sweetening the pot for the night were the Ice Ice Babies opening the night and making their bout debut before a live audience. The energy of the junior team of Queen City was running rambunctious around the rink as they quickly donned uniforms for the night and their team photo. The Ice Ice Babies divided into two teams of Frost Bites and Snow Bunnies, nervously taking in the energy of the crowd as they circled the track for their introductions. 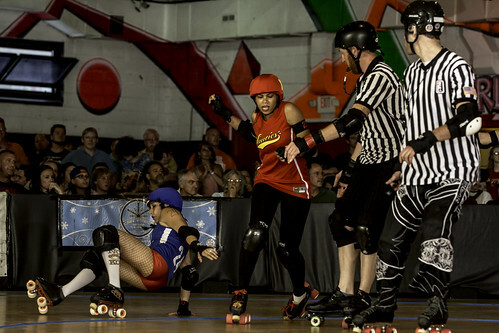 The bout was limited to a 10 minute period with one minute jams. Yet it probably felt like an eternity for the fearless and talented bunch on the rink. 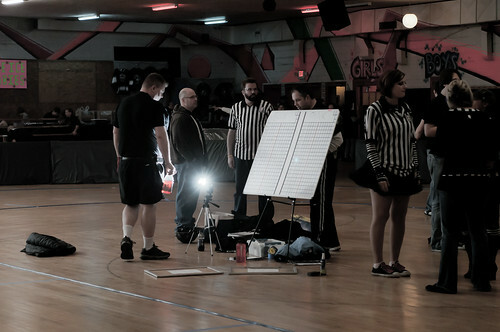 The referees had to race to keep up with the Babies jammers. Scoring ran high with the score reaching 90 to 84 by the end of it all. 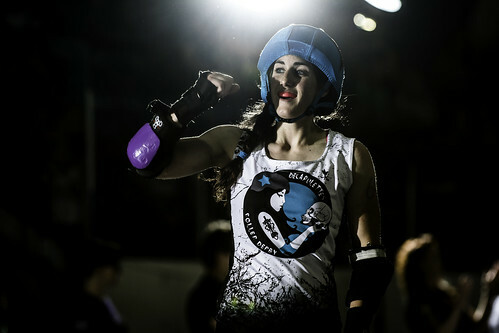 The Ice Ice Babies bout meant the Knockouts and the Suicidal Saucies had to warm up twice which may have dissipated some of their bout energy. 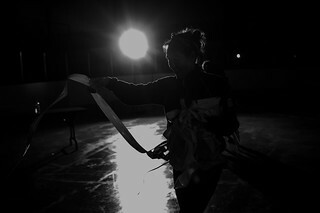 The night was less of the devastation and more into the go for broke jamming and defensive posturing. The blue was more than dressing down the Saucies as the first period ended with a 101-45 advantage. 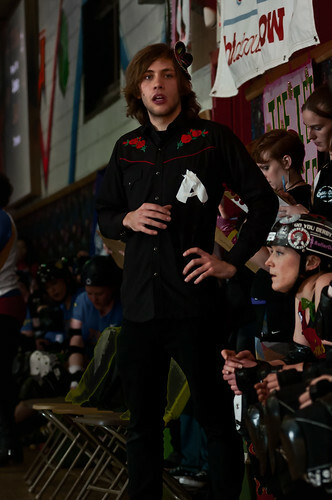 Crazy Legs only took to the jammer line once for the Knockouts but they had the indomitable BJ Harmstrong and Ruby Revenge and Unsung. It was hard to not notice those particular ruby red shorts on the line. The 101-45 halftime advantage underscored the decisiveness of the Knockouts as they preyed on and pried upon holes in the Saucies pack. 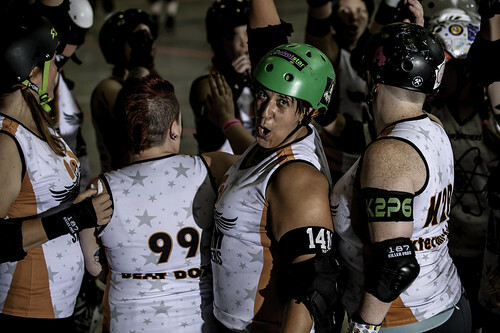 By the end of the night the lead crept near the triple digits, but that was not the story of the night which was another nose injury inflicted upon QCRG and the Saucies’s Nova Cain. Brave soul that she was, she came back donning the face guard to jam again for her team. The night concluded with a 191-93 score for the blue, with the house music blazing LMAO and the ladies dancing on the track. With some shaking of hands with the audience and hugs with friends, it was not the usual everyone dashing to ring around at trackside to get the low or high five with their heroes of the night&#emdash;at QCRGm the crowd is already as close to the track as they can get&#emdash;it’s that intimate. The after-party at the Renaissance was a short drive away after the coach of the Saucies had proffered a bottle of American champagne to the victors. The theme of the night was soup, and homemade soup it was that hit the spot for the hungry and exhausted skaters who were slurping on the likes of bacon and cheeseburger, pasta, cheese and beer, a sweet potato chili that was all vegetarian and all good. While trying to stay on the outside and witness the red and the blue, we offered the Knockouts captain the Toblerone rose we had been carrying across the border. It may have been the dumbest thing we ever tried to do, but getting the hug and the invite to sit with the blue was even more than icing on the cake, it was being in the middle of a dream come true. It could have been a dangerous tactic by yours truly to wear the Team Canada t-shirt when Team USA’s Addy Rawl was sitting at the same tabke, wearing her Team USA jacket and shirt. We could only remark upon the World Cup match of Stars vs. Stripes back in Toronto when the two sides during warm-up and introductions circled the track at a breakneck speed never before seen in Canada. She remembered the night well, and remarked how exhausted she was afterwards. Surprising how feisty some Team Argentina player can be, shouting “blooooo!” with the accompaniment of the rest of the bloo cast. A photographer’s job should never stop and some discrete photos were taken here and there. Journey was playing downstairs which beckoned Diamond and crew to the gym hall while others took leaves to go the after-after-party. It seemed a shame not to partake of the price of beer in Queen City, and after passing over the choices of Blue or Canadian and instead asking the barkeep for a good American beer, he offered Budweiser. We talked about the differences in Canadian and American beer, and he said something along the lines that the US was not allowed to offer the high alcohol content up in Canada. While the beer was going down and soup being sipped, the clean-up was on with Mama and her small motley crew washing out crock pots and bowls and figuring out how to carry what was left back home. [It was all good soup, just more than could be supped on.] While everyone took off or finally fell asleep watching the end of Fargo on the high definition cable in the darkness, it was time to hit the pillow yet again in America. This is a story still in the writing and editing stage. Stay tuned for more details here as the Suicidal Saucies go head to head against the Nickel City Knockouts in Queen City on Saturday night. That’s today! 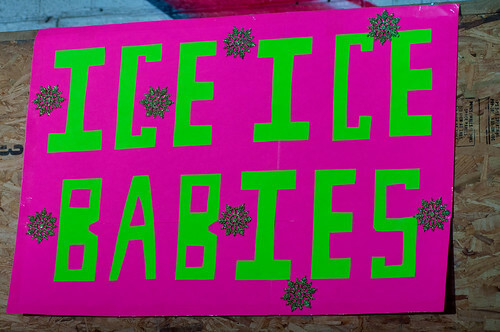 Also, the Ice Ice Babies square off against each other too! And here the story begins. Stranger in a Stranger Land – part 4. Part 3 still in the writing stage. Welcome to the Paradise ! Venturing forth for the third time down to Queen City to see a spat of epic family proportions as the Suicidal Saucides led by Señor Wences would face the Nickel City Knockouts captained by the Lamb Chop herself and square in between was Mama Chops trying her best to cheer on her two Derby siblings as equally as she would or could. Inside she may be bleeding a certain colour that rhymes with mountain dew but that did not stop her from bolstering the league and bout as much as she could. The contents for the soup repast after party sploshed in crock pots in the back of the truck as the family truck driven by ShockHer wended its way through North Tonawanda. It as a night of sweets for the sweet, Lake Effect Ice Cream was present and Diamond CrushHer commanded me to try one on as a treat. The server’s favourite was the Rocky Road, which we tried although Salty Caramel will have to be tried next time. The after-party was a slice of my blue heaven. Shouts of yuuuuuuuup! ringed through the room as the skaters dove into the many varieties of soup prepared by the ladies of the league. A sweet potato chili was out of this world and a bacon and cheeseburger soup disappeared fast. The pasta was a flavourful filling bowl and the cheese with a lot of beer was spicy yummy as were all the others. And chocolate nutty rice krispies to round out the edges. With great trepidation, with camera gear on our shoulder we looked around the room filled with the black and red and blue. How to break the ice? Maybe a rose? or chocolate? Done. Introduced as the “photographer from Canada” it was realized a great responsibility lay on our shouder. Wearing Team Canada t-shirt might not have been the best idea as Addy Rawl herself sat across the table wearing her Team USA jacket and shirt. I could only commend her for her role on Team USA and the memory of seeing the Team USA Introduction during Stars vs Stripes at World Cup was the fastest thing we had ever seen on skates. She remembers being exhausted after all that. This is part 2 of a continuing story of our first venture into America to see Derby in the United States. 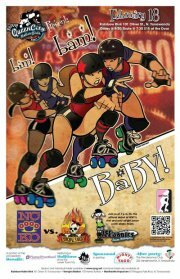 To be more specific, the home opener of the Queen City Roller Girls of Buffalo, NY on January 7, 2012. What a way to start the year. It was while on the road for the first time to America for Derby and reflecting on the entire experience, a light bulb flashed and a whole slate of words crystallized before our eyes. It was not the proverbial Ten Commandments, but it was a way to conduct oneself, the etiquette of being a visiting photographer. We had just gone through customs at Fort Erie and landed at the Greyhound bus station in downtown Buffalo. What had preceded this was a myriad of details and a boatload of questions that had filled the mind for weeks and had to be settled: how to get across the border (both of them preferably), how to get to Buffalo, how much was the busfare to Buffalo, what to pack, how to carry what had to be packed, how to get to the Rainbow Roller Rink to see my favourite league down under—those crazy Queen City Roller Girls. 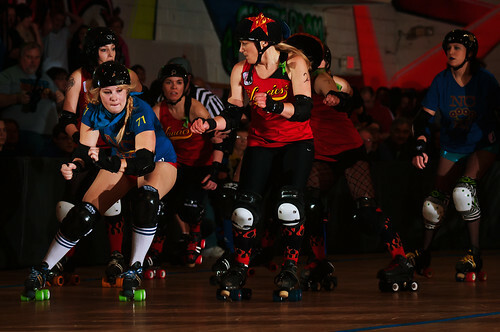 The teams for the night event would be a reprise of the 2011 championship final as the 2012 season opener: the pink of defending champions Devil Dollies vs. the blue Nickel City Knockouts. What better way than to Kick Out The Jams? It was a marvel to watch Queen City set up for the evening from scratch to finish in what would be a sold-out bout; QCRG officials and volunteers everywhere, laying down the track, ticket sellers, ticket takers, crew installing lights overhead into the ceiling, putting out the bleachers, handle a session for the entire league photo, photo mediator B-17 dealing with press, the ongoing Queen’s Court chitchat, zebras and roster boards, a bake sale setup for the Ice Ice Babies who are the Queen City Roller Girls junior team, a live band setup and stage for half time intermission, merchandise table, concession and food, stats table, scoreboard table, wires and power bars everywhere, putting up sponsors banners including Mighty Taco, setting out the players benches and penalty bin, the video crew in the form of Mr. Fit, Mama Chops [den mother to the league] out to handle the after-party setup for her derby ladies, players and teams rolling in to get changed and warming up on the track, it was indeed the universal experience of game day. 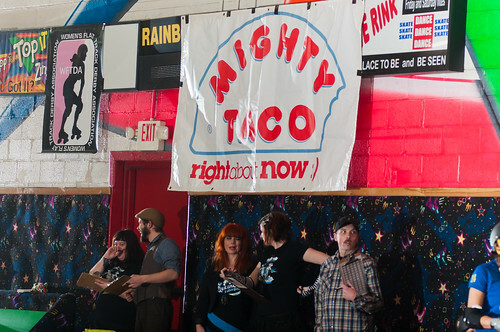 All thanks to the biggest fan of the league who would be the owner of Rainbow Roller Rink. While all this unfolded around me, what had accrued from the experience of travelling on the road or even being at home amongst the leagues in and around Toronto and the grand experience of Blood and Thunder World Cup, enabled me in knowing how to deal and what questions to ask. Where to shoot. How to shoot. In other words: How to fit in. 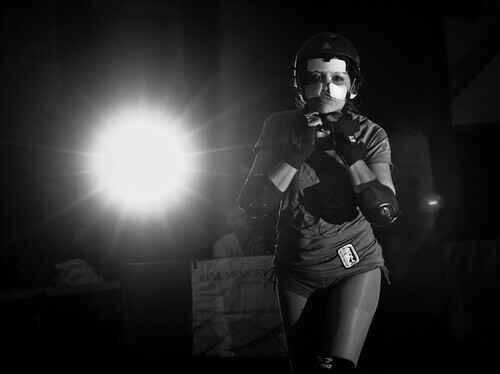 Ask your hosts as far in advance as possible if you can tentatively shoot their next bout. Find out how much lighting and gear you can bring along. Leagues may have an off-camera flash policy. Some leagues may set aside a room to stow gear or bags. Others, you may be lucky to get floorspace. There is no such thing as the absolute gold standard. Every league does its best. Every league has its own way of doing things. Every league has its own personality. Respect them if they deserve respect. Otherwise, just leave. It’s your time. Never assume anything. No attitude. Always be ready. Life’s biggest lesson taught to me by Boris Spremo [Toronto Star photographer supreme]. Listen to your media liaison or photo wrangler. Abide by whatever agreement you choose to sign. If you do not like the agreement, just walk away. Or discuss it with someone in the know. Know your rights. Take the best shots you can. That’s what the league expects and what you should expect of yourself. Every picture tells a story. You are not there as a spectator on their dime. You never know when to expect the unexpected. There is always something going on, but know you cannot capture it all. Do your best. Deal with it. There may be team rituals and introductions you have never seen before. React to it. [Can you say bagpipes Tri-City Thunder?] If you are having a bad day, deal with it, don’t show it. If your lighting or flash has died, be creative. Or go back to basics. Never surrender. The teams on the track never do. 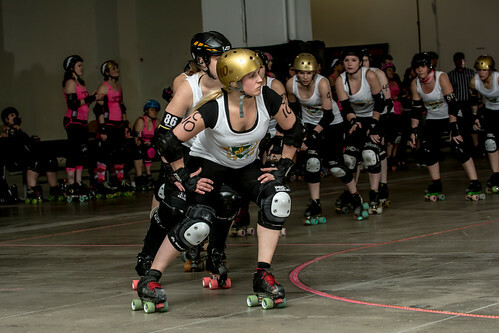 Know the rules of Derby. Know the lines. Know the lines you cannot cross. The ones on the floor or not. And for all those tyros out there, don’t shoot and skateboard around the track at the same time. Know or get to know the NSOs and volunteers. Know the referees. Listen to the announcers. They always can tell you where all the best action is. 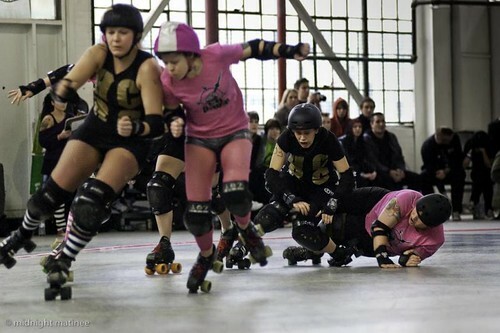 Until the bout is over, skaters are skaters on game day. Coaches are coaches. They will still talk to you but their focus should be the bout ahead. Try not to intrude on their space. Shoot the stretch at your own peril. God is in the details. Sweat the small stuff. Plan as best you can. Put your experience to use. Learn as much as you can about the venue if you can. Look at game videos to see their lighting and where photographers set up. Some leagues already know what photographers require, but be prepared to ask questions to find a friendly solution. Capture the atmosphere. Shoot a bit of everybody and introduce yourself. You never know who will tag themselves or what photo will be an unanticipated favourite by some player. Don’t get in the way of the crowd. They paid for their ticket and deserve to be there. Above all, lesson learned: officials first. Don’t get in the way of the stats keepers or sit where the whiteboard needs to be. You definitely do not want to be part of a referee takeout. Treat your fellow photographers well. They are there to make everyone on the track look their best in the best way they can. 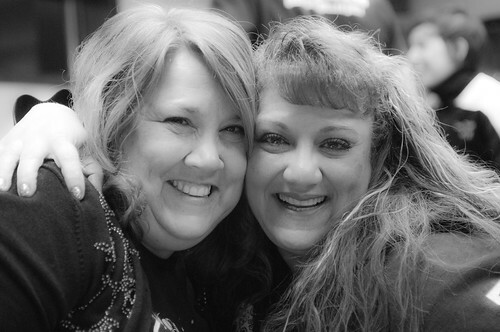 They often impart to you where or how they shoot. Keep on learning and learn from the best. At the end of the night, thank your tired hosts again. Sincerely. Queen City love their Blue, Molson or otherwise. Bloo! Of course saying it and doing it can diverge, but do your best. If you believe it, you’ll do it. And if you succeed, not only do you have the photos of a lifetime or a moment in life, you have new friends who will let you come back. 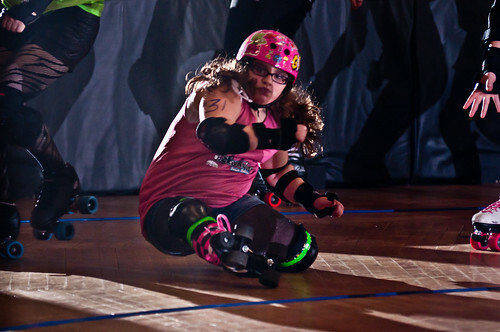 So, thank you Derby and leagues and all us hard-working photographers everywhere. Thank you Queen City for your generosity and hospitality and the Cherry Coke. 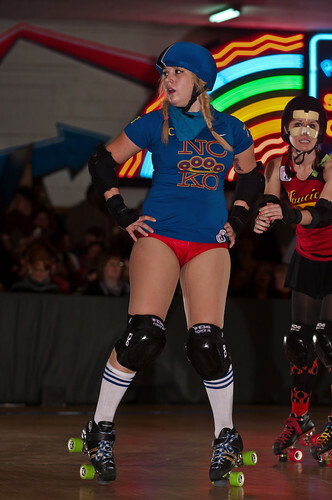 And once I write the rest of part one, there will be undeniable evidence there is a Derby God-dess. DSC_1287-2, originally uploaded by Midnight Matinee 24. Queen City Rollergirls home season debut with a rematch between last year’s teams in the finals of the QCRG Championships: Devil Dollies and Nickel City Knockouts.Featured here is Crazy Legs from the NCKO donning face guard after having her nose broken at Blood and Thunder World Cup while bouting as captain of Team Argentina.